I’m not going to front load much here. I’m actually using this review as a short lesson in my best selling novels class on organizing a review, so here you go! I got into the Iron Man game late. Honestly, I can say that the Marvel Cinematic Universe is what hooked me on the character of Iron Man – not the comics, but I’ve been following him ever since, even into the inception of Ironheart: Riri Williams. 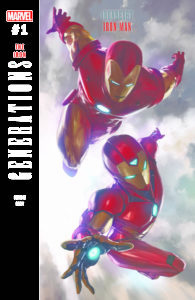 So, when I heard about the Generations one-shots covering “The Iron” (Iron Man and Ironheart), I was thrilled, and when I heard that Brian Michael Bendis was writing it, I was giddy. Multiple-Eisner award winning Brian Michael Bendis has been and continues to be the man. His Spider Man run has contained some of my favorite comic writing since…well, ever. And if you read my review yesterday, you know that I think Bendis captures dialogue better than most. “The Irons” is no different. Like Miles Morales in “The Spiders,” Riri Williams finds herself, at the beginning of the issue, tossed into a strange version of Chicago that she soon discovers is the future. Stumbling upon a team of “Mighty Avengers,” Riri ultimately (pun intended) finds herself in the presence of a 126-year-old Tony Stark who attempts to calm Riri and help her make sense of her current situation. Most of the issue is the conversation between the two of them, and I’m totally cool with that! Franklin Richards shows up, and the ending is a bit ambiguous, but the big takeaway is the interaction between the Irons…the way it should be. I’ll quickly go into the writing before I discuss the assembly of the rest of the book: it’s great. Brian Michael Bendis is one of the only comic book writers that I want more dialogue from and less action on the pages, and often, he gives me just that! Thought bubbles that move all the way up or down the sides of pages is what I expect and admire. The panel layout of this issue is unique. In “The Spiders,” we have a blend of both classic page layouts and slightly more modern page layouts, but with “The Iron” issue, we get what I would call a futuristic breakdown on the pages. Panels sweep and shift in waves across the page or over the top/bottom of the page. Panel borders are rounded or strangely shaped with double frames. I would say that the panel construction fits the tone and mood of the issue: moving uncertainty vs. confidence and ability. The creative team here is attempting to capture a time not yet explored, and they do a fantastic job of showing us a possible future of the medium. The art, however, is not polished and computer-generated-looking like one might assume from the cool, slick panel/page arrangement. The art looks hand-drawn, and the coloring is not meant to look uber-sharp. To me it feels like the futuristic look of the panels is in contrast to the more simple, classic art style. Maybe this is to show us the complex but delicate nature of Riri and a 126-year-old Tony Stark, maybe I’m over-thinking it, and it’s just art on some cool panels. Either way, I dig it, and I’m in for another Generations title tomorrow! And I will be picking up the rest of them as well.